The EudraCT is a database of all clinical trials which commenced in the European Community from 1 May 2004, and also includes clinical trials linked to European pediatric drug development. 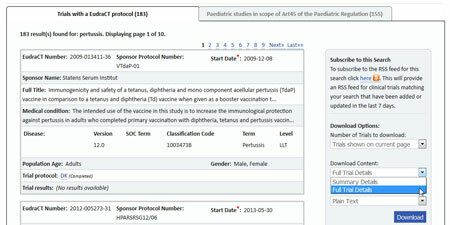 The EU Clinical Trials Register provides public access to the data in EudraCT. Support for EudraCT was added in BizInt Smart Charts 4.1 in October 2015. Summarizing Country Data from EudraCT trials. Describes how to create identify related trials in different countries and create a report summarizing key data (e.g. enrollment). October 2015. Note: Some customers are reporting an "Unable to understand file" error message when importing data from EudraCT. This problem was fixed in version 4.2.3 (October 2016). For a workaround with earlier versions, see this document - Workaround for EudraCT Error. Perform your search on the EU Clinical Trials Register search portal. Use the Download panel on the right side of the page to download your results. 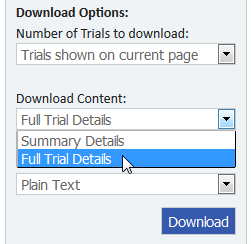 Under Download Content, select "Full Trial Details" and "Plain Text", as shown below. Save the trials on the current page as a .txt file. Repeat for each page of trial results. If you have multiple pages of trials, you can use File | Combine to merge all the results into a single file.